Last summer I built this deck for a neighbor, but it needs a retaining wall next to it. 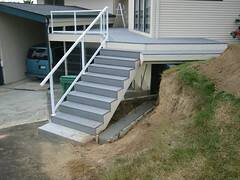 So this summer I am pouring a cement wall next to the steps so that the lawn can run right up to the steps. Today I set the footing and Markus helped me pour the cement. It is convenient to have several summer jobs in the neighborhood. Tonight I cleaned the scum line on Blue Wing and motored around a little. I saw a small seal laying on a floating log. He let me come within fifteen feet. I should have had my camera! That'll teach you to leave your camera at home.